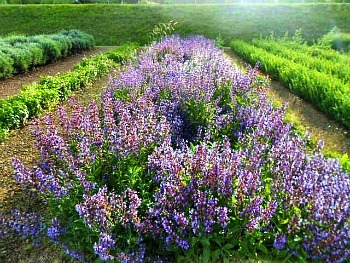 The 'Giardino delle Erbe' (Herb Garden) in Casola Valsenio: a Feast for the Senses. Located in Casola Valsenio and named after its founder, the Augusto Rinaldi Ceroni Herb Garden ('Giardino delle Erbe Augusto Rinaldi Ceroni') is a botanical garden dedicated to the conservation and growing of plants of special medicinal and aromatic interest. 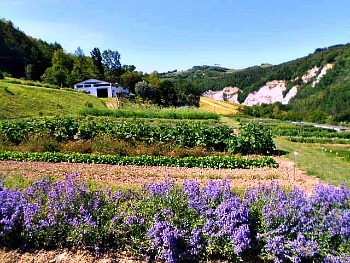 Owned by the Region Emilia-Romagna, the Herb Garden is managed by the municipality of Casola Valsenio, where it is located, in association with the Comunità Montana Valle del Senio. 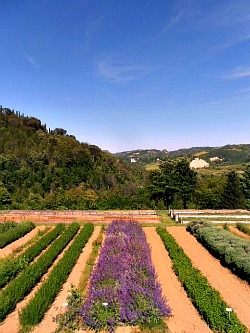 The picture below shows the general outline of the garden, located on a small terrace overlooking the Senio valley, with a service building/visitor centre at the entrance (to the centre-left of the image), while above is portrayed Sage (Salvia officinalis) in full bloom. The Herb Garden, included in the Museum system of the Province of Ravenna and within a network of Teaching Farms, includes approx. 450 species of wild plants used in the kitchen, medicine and cosmetics since the late Medieval period, when they were cultivated in the herb gardens of convents and monasteries. The garden constitutes a centre of knowledge and valorisation as regards the cultivation and use of medicinal plants, thanks to activities that range from research to popularization and from experimentation to teaching, involving both experts and visitors of all ages. The garden can be visited free of charge during daytime hours in every period of the year; visitors just have to observe the rules of conduct dictated by common sense and by respect for the structures and cultivations. 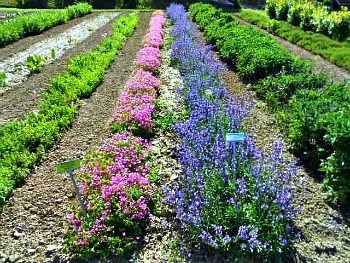 Visitors are therefore required to follow the paths outside the cultivated plots, and must not pick or damage the plants. To gain a greater understanding of the plants and flowers in the garden through touch and smell, there is a specific route called the 'Gallery of Bouquets'. On working days and when other events are held, it is also possible to visit the 'Chamber of Marvels' and purchase medicinal plants, 'forgotten fruits' and other products derived from the garden's herbs, on display in the shop-emporium (an aerial view of the garden below shows how the herbs are grown in an orderly fashion on elongated plots, after the old tradition followed in kitchen gardens and monasteries). Professor Augusto Rinaldi Ceroni, to whom the garden is dedicated, was an educator and pioneer on the subject of Italian herbs, as well as creator and animator of many tourist and cultural initiatives that have added so much to Casola Valsenio's renown. His work particularly focused on herbs, and it started at the end of the 1930 with the creation of a first kitchen garden composed of medicinal plants, which was gradually enriched in symbiosis with the Primary and later Junior School, where Ceroni was both teacher and headmaster – so that he later came to be known to everyone simply as 'the Professor'. 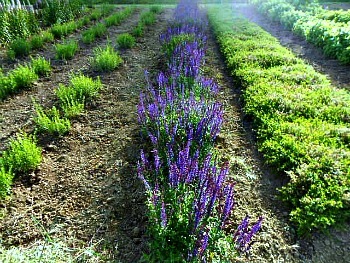 His goal in life was the study, divulgation and experimentation on medicinal plants – lavender in particular, of which the garden is particularly rich. – Officinal Plants. All the species containing active principles, useful for the prevention and treatment of human, animal and plant diseases are grouped in long, colourful rows (see an image below). Among the numerous species grown in the garden are Chamomile, Hawthorn, Henbane, Belladonna, Sage, Valerian, Echinacea, Digitalis, etc. Officinal plants also include aromatic ad cooking herbs, used as spices and in food preparations; among the best known are Chive, Salad Burnet, Tarragon, Rhubarb, Lemon Verbena, several Mint and Oregano varietes, Borage, Nettle, Lovage, Calamint, Angelica and Hyssop (portrayed in blossom in the image above). These latter are also known as melliferous plants (preferred by bees), and include Lavender, Lime, Horehound, Motherwort, Catnip, Sulla, Thyme, Coriander, Sage, Rosemary, Hawthorn – and many others. Some plants such as Helichrysum, Honeysuckle, Jasmine, Mint, Absinth, Lavender, Pelargonium, Thyme and Peonies give off highly distinctive leaf or flower scents, which – thanks to their particular fragrances – end up in cosmetic creams and preparations too. – Arboretum. Among the trees and shrubs of medicinal interest are also the plants yielding 'forgotten fruits'; i.e. fruits popular in the past and not commonly grown any more – such as Rowan, Service tree, Medlar, Dogrose, Hawthorn, Buckthorn, Hazelnut. – Gypsum (chalk) Garden. A special corner has been set up to showcase the main botanical essences found in the Gypsum Ridge Regional Park ('Parco Regionale della Vena del Gesso Romagnola'), which belongs to the network of protected areas of the Region Emilia-Romagna (read below). Other plant groups can be spotted by simply strolling in the Herb Garden: e.g. 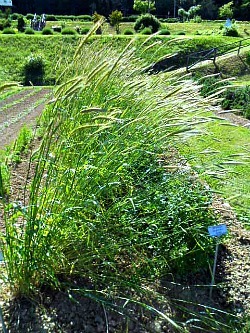 soil consolidation plants, plants used for dyeing, poisonous plants, medicinal and floricultural plants, plants of economic use (such as the cereals; see for instance the image below). 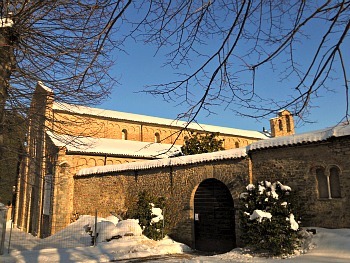 The Herb Garden is located within the 'Vena del Gesso' Regional Park – an area which, in the municipality of Casola Valsenio, also comprises the Abbey of Valsenio (pictured below), dating to the 10th century; the Cardello, museum-home of the local writer Alfredo Oriani – surrounded by a monumental park spread on a hill crowned with Tuscan cypresses – and Monte Battaglia (715 m), famous for being a military outpost during WW2, commemorated by a monumental area dedicated to peace betweenthe nations, and located at the foot of the ruins of a Medieval fortress. 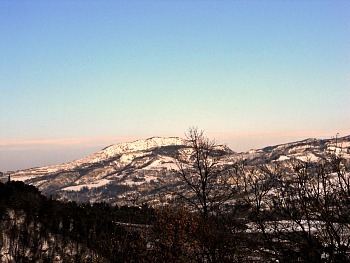 From the summit of Monte Battaglia – the highest elevation in the area – it is possible to appreciate in its entirety the 'Vena del Gesso Romagnola', the nucleus of the Regional Park that was established in 2005 to protect and enhance enjoyment of this rocky ridge, which stretches out for some twenty kilometres in the Apennines south of Imola and Faenza. This gypsum outcrop is characterised by imposing and spectacular layers of calcium sulphate that have been variously crystallised, then compacted into a rock called 'selenite' – that is "moon rock", due to its 'lunar' reflections. The 'vein' also comprises large and profound karstic features, with the formation of sink-holes, swallow-holes and several caves, which are an attraction for Italian and foreign speleologists alike. The presence of man in this area dates back to the distant past, when the caverns represented a source of protection and a place of worship. During the Medieval period the area was subject to still further human use, with the opening of gypsum quarries and the construction – using gypsum blocks – of rural chapels and fortresses, which were then followed by farmhouses, churches and small hamlets. The numerous itineraries that wind their way through the park offer visitors an overall view of the work of nature and the history of man, together with a wide panorama – from the top of the ridge – across a truly beautiful landscape. 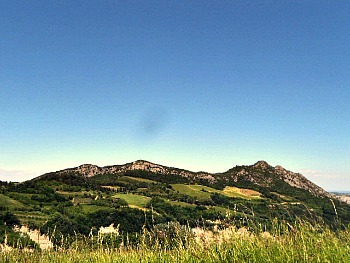 From there, looking higher up, a sequence of blue-green mountains opens up towards the summit of the Apennines, while lower down is visible an arid web of gullies (the 'calanchi'), stretching all the way to the plains of Romagna, dotted with the pale colours of villages and towns and bordered – on clear days – by the azure blue line of the Adriatic sea in the distance (below, is a picture of the central section of the 'Vena del Gesso' taken from the south, with Monte Mauro – 515 m – to the right). The extension of the gypsum (or chalk) vein ('Vena del Gesso') along an east-west direction means that the two slopes of the ridge enjoy two totally different environments; the slope facing south is arid and sunny, with a Sub-Mediterranean climate, while the north-facing side is green and fresh with a continental climate – hence the presence in these chalky outcrops of a splendidly rich and varied flora and fauna. On the southern slope, in the hot and arid chalk outcrops, there are specially adapted plants: on this side, the flora – limited in quantity and not very extensive – includes the rare Persian fern, Cheilanthes persica, which in Italy is only found in this one location. The northern slopes, instead, are covered with woods and chestnut trees thanks to their fresher and more humid micro-climate. As we have seen previously, the environment of the chalk ridge has been recreated also in the Herb Garden, with the allocation of a plot of land called the 'Selenite Garden' – a sort of rock garden where plants that are typical of the ridge are being cultivated (in the final picture below, an image of the 'Vena del Gesso' in winter, taken from the Herb Garden in Casola Valsenio).